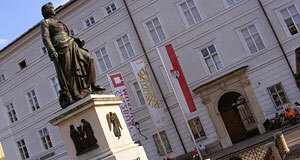 Note: This article deals with the old town museum; the new Salzburg Museum is covered seperately in greater detail. The former Carolino Augusteum, or, as locals used to call it, the "CA" was something like the mother of the museums in Salzburg until it was re-named into "Salzburg Museum" and moved to the Neue Residenz in 2006: Spread over five branches, it aimed to display and spread the history and culture of the city and province of Salzburg and its surroundings from prehistoric times to the present. The Carolino Augusteum suffered for a long time the fate of many European museums: it smelled very old, somewhat out-of-time and not very exciting as long as you were not really deep into the subject; however, things have changed over the last couple of years. The new Salzurg Museum is a modern museum with appealing, multimedia exhibitions and visitors with all sorts of backgrounds. The permanent exhibitions are supplemented by changing ones, by interactive programs, guided tours and youth workshops. The main museum is still dedicated to the complete history of the city and province of Salzburg. Highlights from Celtic times include a Bronze helmet that was found near Werfen by the Pass Lueg, as well as the famous "Halleiner Schnabelkanne" from the Dürrnberg by Hallein; the area around the salt mines of Hallein were rich hunting grounds for local archaeologists, parts of the exhibition include information on the excavations that are still going one. Sacral art from Romanesque and Gothic times include the "Halleiner Altärchen", the "Little Hallein Altar" from 1440 and the altar "Virgo inter Virgines" from 1480. A Renaissance salon from Goldegg, oilpaintings by Johann Michael Rottmayer ("Darstellung der unbefleckten Empfängnis" from 1697) and Paul Troger ("Das Salomonische Urteil"), and a collection of Baroque musical instruments display the prime of Salzburg and its wealth of the days. Finally, paintings of the Biedermeier style lead the visitors into the time after Salzburg′s secularisation in the early 19th century. Carl Spitzweg′s famous painting "Sonntagsspaziergang" from 1841 attracts much attention, but a big part of this exhibition is dedicated to the local painter Hans Makart (1840 to 1884), after whom the Makartplatz between the Dreifaltigkeitskirche church and the Tanzmeisterhaus is named after. Contemporary artwork is on display in changing exhibitions, although it is more dealt with in more detail in other museums of Salzburg, such as the Rupertinum or the Salzburger Museum der Moderne. Other branches of the Salzburg Museum are the Spielzeugmuseum (Toy Museum), the museum in the Hohensalzburg Fortress, the Salzburger Dommuseum and the Volkskundemuseum in the Monatsschlössl at Hellbrunn Castle. They are described in separate articles.